Marks/Label: Words printed in red ink on upper left side reads: Post Office, Bridgewater, N.S. Narrative: Eric Denton Slauenwhite was born 19 September 1922 in New Canada, Lunenburg County, the son of Norman and Laura Slauenwhite. In his younger years, he served in the United Kingdom and Continental Europe with the North Nova Scotia Highlands from 1943-46. Received the Canadian Volunteer Service Medal and Clasp. Slauenwhite was then Fisheries Warden on the LaHave River from 1953-57. Eric then worked in the public service as caretaker of the former post office on King Street for 31 years. The family lived upstairs on the second floor from 1957 until he retired in 1988. They then moved to 12 Hillcrest Street and then Queen Street. After Eric passed away, Gloria moved to Pine View Apartments and lived there until her death. Member of St. Paul’s Lutheran Church, and life member of the Royal Canadian Legion, Branch 24, Bridgewater. Married to Gloria Corkum of Pentz, N.S. and they raised 4 daughters. Eric Slauenwhite died at age 82 on 23 May 2005 in Bridgewater. Gloria died 25 May 2013. Both are buried in Brookside Cemetery, Bridgewater. 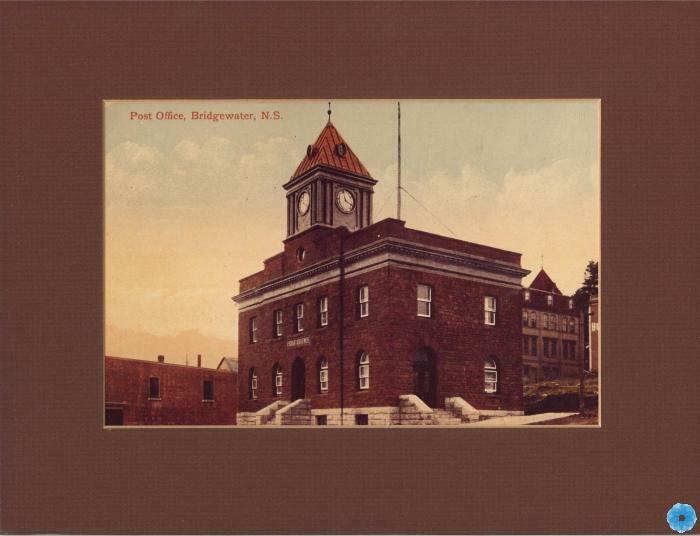 Description: Colour photograph of the former Bridgewater post office building, King Street, Bridgewater. Large brick building with many windows. Large clock tower sits on roof. Granite steps in the front and side of the building. A sign with word Post Office is over the arched entrance door. Partial vview of the Courthouse in the background as well as the letters on the side of the building for the Bulletin newspaper office at the right. Brick building with two windows at the left of the post office building. Large pole visible above the post office roof. History of Use: Photograph given to Eric Denton Slauenwhite on his retirement as caretaker of the Bridgewater Post Office after 31 years of service.